Three years after the Birdcage 75th, Pininfarina returns with the Sintesi, a new concept car that explores ideas and solutions for the car of the future. 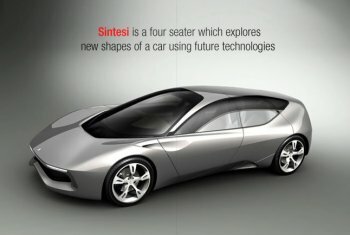 Before being unveiled at Geneva, the Sintesi has been the subject of a teaser campaign which has attracted a great deal of interest online among specialist journalists, scoring more than 250,000 hits on Google. This was made possible by close collaboration with Nuvera, which developed the Quadrivium Fuel Cells system, the various components of which were distributed around the car, with four fuel cells positioned near to the wheels. The result is that the space for passengers is much more generous – in proportion to the total volume of the car – without detracting from the sporty line with its relaxed, elegant profile which is sleek, tapered and aerodynamic (Cd = 0.27). The modular nature of the fuel cells, combined with the batteries and a sophisticated overall electronic architecture (developed with PI Shurlok), allows for modular use of the available power depending on driving conditions. The Sintesi was imagined in a setting of Transparent Mobility which, thanks to Clancast®, the radio technology developed by Reicom after years of research, envisages that all cars act as nerve cells, creating a dynamic communications network managed by a disseminated intelligence. A real “living connective tissue” on which data and information about traffic and security, audio and video, Internet and cross-media content can travel. A concept of wireless connectivity that establishes a continuous, transparent dialogue between the town, the road and the vehicles that we will drive in the future, without limiting the motorist’s autonomy, but increasing his sense of freedom. This futuristic scenario, based on concrete, existing technology, opens the door to advanced active safety solutions which in turn have made it possible to design the car with volumes that are not conditioned by today’s bulky passive safety systems. The lights become focal points through which the car dialogues with its environment. In addition to the innovative LED system supplied by Osram, which made it possible to create a simple, strong shape that underlines the car’s central axis, the ‘headlights’ also incorporate the telecameras and the proximity radar system. In Geneva other cars will make their debut on its clients’ stands. The Ford stand hosts the debut of the new Ford Focus Coupé-Cabriolet, which is manufactured in the Pininfarina plant in Bairo, where the “job one” was celebrated on February 21. Like the other models of the Focus family, the new Coupé-Cabriolet, which will be launched this Spring, has a more gutsy, sporty look both inside and outside. The Granturismo S has its world première on the Maserati stand, a sporty, high performance version of the Granturismo designed by Pininfarina, which won the “Best in Show” award at the 2007 Geneva Motor Show. The Model Year 2008 of the Alfa Spider debuts on the Alfa Romeo stand. The model was developed jointly by Pininfarina and the Alfa Romeo Style Centre, and it includes significant improvements in the interior, guaranteeing an even higher level of comfort and well-being on board. The 2008 version of the Alfa Brera also makes its appearance; like the Spider, it is built in the Pininfarina plant in San Giorgio Canavese. "This edition of the Geneva Motor Show," said Andrea Pininfarina, "also represents a moment of joy and pride for the induction of my father, Sergio Pininfarina - our Honorary Chairman - into the European Automotive Hall of Fame, marking high points in the history of our company."